Sweet Frog Enterprises, LLC is the fastest growing premium, all-natural, self-serve frozen yogurt restaurant company in the country. The company was founded in 2009 and is based in Richmond, Virginia. Currently, Sweet Frog has over 335 stores operating in 25 states, with international locations in the United Kingdom and the Dominican Republic. 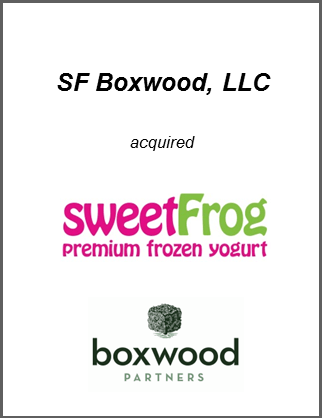 Boxwood Capital Partners made a growth capital investment in Sweet Frog Enterprises, LLC.